Central Reykjavík seen from Hallgrímskirkja. Its latitude at 64°08' N makes it the world's most northern capital of a sovereign state. 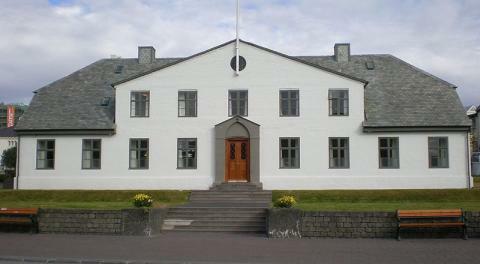 It is located in southwestern Iceland, on the southern shore of Faxaflói Bay. 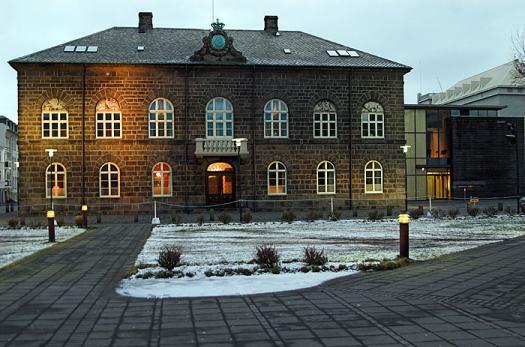 With a population of around 120,000 (and over 200,000 in the Greater Reykjavík Area) it is the heart of Iceland's economic and governmental activity. 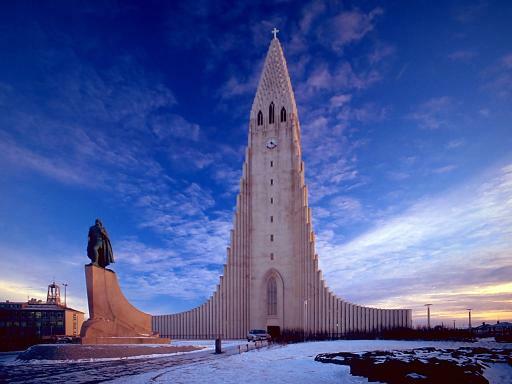 Reykjavík is believed to be the location of the first permanent settlement in Iceland, which Ingólfur Arnarson is said to have established around 870. Until the 18th century, there was no urban development in the city location. The city was founded in 1786 as an official trading town and grew steadily over the next decades, as it transformed into a regional and later national centre of commerce, population and governmental activities. Today, Reykjavík is the centre of the Greater Reykjavík Area which, with a population of 202,000, is the only metropolitan area in Iceland. As a highly modernised capital of one of the most developed countries in the world, its inhabitants enjoy a first-class welfare system and city infrastructure. Its location, only slightly south of the Arctic Circle, receives only four hours of daylight on the shortest day in the depth of winter; during the summer the nights are almost as bright as the days. It has continued to see population growth in past years as well as growth in areas of commerce and industry. Reykjavík was ranked first on Grist Magazine's "15 Greenest Cities" list. 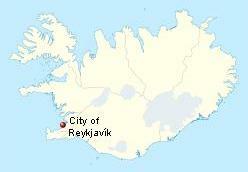 Reykjavík is located in southwest Iceland. The Reykjavík area coastline is characterised by peninsulas, coves, straits, and islands. During the Ice Age (up to 10,000 years ago) a large glacier covered parts of the city area, reaching as far out as Álftanes. Other parts of the city area were covered by sea water. In the warm periods and at the end of the Ice Age, some hills like Öskjuhlíð were islands. The former sea level is indicated by sediments (with clams) reaching (at Öskjuhlíð, for example) as far as 43 m above the current sea level. The hills of Öskjuhlíð and Skólavörðuholt appear to be the remains of former shield volcanoes which were active during the warm periods of the Ice Age. After the Ice Age, the land rose as the heavy load of the glaciers fell away, and began to look as it does today. But the capital city area continued to be shaped by earthquakes and volcanic eruptions, like the one 4500 years ago in the mountain range Bláfjöll, when the lava coming down the Elliðaá valley reached the sea at the bay of Elliðavogur. The largest river to run through Reykjavík is the Elliðaá River, which is non-navigable. It is one of the best salmon fishing rivers in the country. Mt. Esja, at 914 m, is the highest mountain in the vicinity of Reykjavík. The city of Reykjavík is mostly located on the Seltjarnarnes peninsula, but the suburbs reach far out to the south and east. 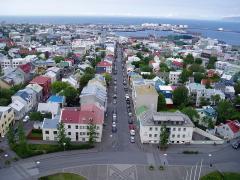 Reykjavík is a spread-out city; most of its urban area is in the form of low-density suburbs, and houses are usually widely spaced. The outer residential neighbourhoods are also widely spaced from each other; in between them run the main traffic arteries and a lot of empty space. Despite its extreme north Atlantic location, Reykjavík is much warmer than most locations at a similar latitude. The average mid-winter temperatures are not significantly lower than those in New York City, with average temperature in January of 0°C, but temperatures very rarely drop below -10°C (14°F) in the winter. This is because the Icelandic coastal weather in winter is moderated by the warm waters of the Gulf Stream. The climate is subpolar oceanic, and the city is on the northern edge of the temperate zone. The city's coastal location does make it prone to wind, however, and gales are common in winter. Summers are cool, with temperature fluctuating between 10–15°C, sometimes exceeding 20°C (68°F). Reykjavík is not a particularly wet city, but it nevertheless averages 213 days with measurable precipitation every year. Droughts are not common although they occur in some summers. In the summer of 2007 not a single drop of rain was measured for a one month. Spring tends to be the sunniest season, May particularly. Annual sunshine hours in Reykjavík are around 1,300, which is comparable with other places in Northern and North-Eastern Europe. 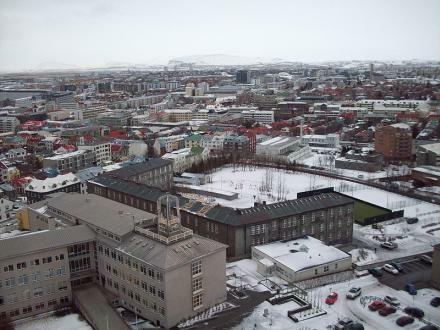 The highest ever recorded temperature in Reykjavík was 26.2°C (79°F), recorded on July 30, 2008, while the lowest ever recorded temperature was -24.5°C (-12°F), recorded on January 21, 1918. Photos courtesy, Wkipedia, the free encyclopedia. You can click for an enlargement. This page was retrieved and condensed from (http://en.wikipedia.org/wiki/Reykjavik) November 2009. This information was correct in November 2009. E. & O.E. This was a virtual tour for us!!!!! !